Pope Francis speaks during a ceremony welcoming him to the White House in Washington, Sept. 23, 2015. Pope Francis is expected to touch on sensitive issues including Middle East refugee crisis, climate change and excesses of capitalism. Pope Francis is expected to touch on sensitive issues including the Middle East refugee crisis, climate change and the excesses of capitalism when he addresses a joint meeting of the U.S. Congress Thursday. Tens of thousands of people are set to watch the proceedings from the Capitol lawn and hundreds more will gather inside the packed House of Representatives chamber as Francis becomes the first pontiff in history to deliver such an address. The address is to begin at 10 a.m. EDT (1400 GMT). Inside the notoriously divided Capitol, anticipation has reached a fever pitch. And no one is more excited than the man who invited him, devout Catholic and House Speaker John Boehner. In a special video, Boehner said lawmakers are very interested in what His Holiness has to say. “His outreach to the poor, the fact that people ought to be more religious. 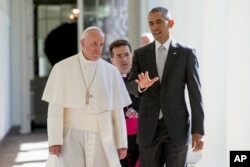 He has got some other positions that are a bit more controversial, but it is the pope!” Boehner said. Pope Francis has spoken out strongly about the dangers to our planet posed by economic injustice and climate change, and the Vatican has welcomed the Iran nuclear deal. The pope’s positions on these issues are closer to the views of President Barack Obama, a Democrat, than those held by leading Republicans. Father Thomas Reese, senior analyst at the National Catholic Reporter, said Congress' reaction to Pope Francis' speech will be revealing. “If he says, you should welcome the immigrants and refugees, you should care for the poor, or you should protect the environment, these are issues, that when he says them, the Democrats are going to jump up and applaud," Reese said. "And what are the Republicans going to do, sit there on their hands? FILE - Rep. Paul Gosar, a Republican from Arizona, speaks during a GOP Doctors Caucus news conference in response to the Supreme Court health care ruling in Washington, June 28, 2012. 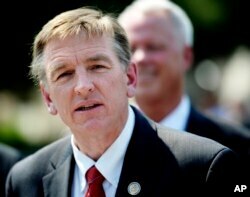 Republican Representative Paul Gosar of Arizona said he will boycott the speech because of the pope’s focus on what Gosar calls the “fool’s errand” of climate change. Gosar, who is Catholic, wrote: "When the pope chooses to act and talk like a leftist politician, then he can expect to be treated like one." On the Democratic side, Representative Luis Gutierrez of Illinios contrasted the compassion of Pope Francis for migrants with the harsh anti-immigrant rhetoric of leading Republican presidential candidate Donald Trump. "In many ways, Pope Francis represents the anti-Trump, the antidote to his venom," Gutierrez said. "Frankly the majority of Americans of all faiths and political stripes across the nation – are very much looking forward to the pope’s visit and the pope’s words because our nation needs a counterbalance, a counterweight to what has become the ugliest, most xenophobic, most anti-immigration campaign in anyone’s memory," he said. 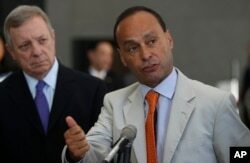 FILE - Rep. Luis Gutierrez, right, a Democrat from Illinois, speaks during a news conference regarding federal policy on deportations in Chicago, June 13, 2014. Billionaire businessman Trump has said some illegal immigrants are "rapists" and "criminals." On other issues such as gay marriage and abortion, the pontiff may say things many Democrats do not like. Democratic House Minority leader Nancy Pelosi of California is also a devout Catholic, but a strong supporter of women's reproductive rights and gay marriage. Reese said U.S. Catholics are politically divided, just like other Americans, and that is also reflected in Congress. Pope Francis celebrated his first Mass on U.S. soil late Wednesday in Washington -- a majestic ceremony that opened with joyously ringing church bells, solemn chants and the first canonization in the United States. Thousands gathered for the Mass, held outside the Basilica of the National Shrine of the Immaculate Conception. At its start, the pontiff conferred sainthood on Junipero Serra, a controversial 18th-century Spanish missionary who spread the word of the church in what is now California. Serra's elevation to sainthood is a sore point for many Native Americans, who say the friar contributed to the abuse and elimination of many indigenous tribes from enslavement and disease. Pope Francis presides over a Canonization Mass for Friar Junipero Serra at the Basilica of the National Shrine of the Immaculate Conception in Washington, Sept. 23, 2015. In his homily, the pope offset criticism, characterizing Serra as someone who "sought to defend the dignity of the native community" and served as an exemplar to "keep moving forward." He also discouraged materialism, bringing up his recurrent themes of environmentalism and compassion for the vulnerable. Earlier, shouts of "Papa Francisco!" rose as the pontiff waved to the throngs from the popemobile part of the motorcade that wound through the campus of the Catholic University of America. A large banner depicting Serra hung over an entrance to the basilica, the nation's largest Roman Catholic Church. Several thousand tickets for the event were reserved for Hispanics from California. Latinos account for a third of U.S. Catholics, according to the Pew Research Center. Earlier Wednesday, President Barack Obama and Pope Francis saluted each other in speeches that were frequently interrupted by applause from the 15,000 guests watching from the White House's South Lawn. During a speech delivered in English, Francis appealed to the United States to take urgent action and help slow the pace of climate change, because the world is at "a critical moment of history." Obama warmly welcomed the leader of the Roman Catholic Church, agreeing that Americans and people throughout the world have "a sacred obligation to protect our planet." The two leaders then held a private meeting in the Oval Office, speaking for about 40 minutes. Later Thursday, the pope will travel to New York City, where he will celebrate Mass at St. Patrick's Cathedral. On Friday, he will address the United Nations General Assembly. On Saturday morning, he'll travel to Philadelphia for this weekend’s Vatican-sponsored World Meeting of Families. 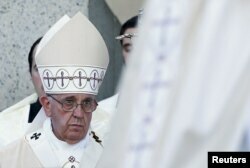 On Sunday, he will celebrate an outdoor Mass, which is expected to draw nearly 2 million people. VOA's William Gallo and Carol Guensburg contributed to this report.